According to reports that came out earlier today, Randy Moss has officially filed his retirement papers with the NFL. While that does not mean we will never see Randy Moss on an NFL playing field again (his teammate of a month last season could tell you that); it does at least raise the possibility. This is however, a player that already took a two year sabbatical in Oakland only to come back to the game with the greatest receiving season of all time in 2007, so I personally have a hard time believing he is done. As a Vikings fan, I would love to see him finish the career the way it started – in purple, in the Metrodome, reviving the career of an aged former Eagles’ quarterback while passing the 15,000 yard and 1000 reception plateau. I really do believe that Moss would still offer an upgrade at the wide receiver position to at least half of the teams in the NFL. However, if Moss is indeed retired, what is his legacy? How can I even begin to describe the player whose talent is indescribable? Over a 13 year career, Randy Moss wowed fans with his athleticism. The Viking’s Offensive Coordinator during Randy Moss’s rookie year, Brian Billick, once stated that Moss had a combination of height, speed, hands, and leaping ability that the NFL had never before seen and might never see again. He went on to say that, “Every field or court he’s ever stepped on to play whatever game he was going to play, he was the best athlete.” Patriots coach Bill Bellichick has referred to Moss as one of the most intelligent and greatest players that he had ever coached. There is no doubt that Randy Moss is an incredibly gifted athlete and one of the greatest receivers to ever play the game but how will he be remembered? On the two highest scoring offenses in NFL history (1998 Vikings and 2007 Patriots), Randy Moss was the highest scoring player. I am usually not so good at being that straight to the point but that’s the simplest way to describe Moss’s athletic prowess. Now in his “retirement” many have raised concern that Randy Moss was “not as great as he could have been”. I would agree with that assessment. 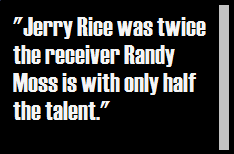 Jerry Rice was twice the wide receiver Randy Moss is with only half the talent. However Rice did not change the game quite like Randy did. If indeed Moss was not at 100% for the majority of his career, than his numbers are even more staggering and an even stronger testament to his incredible ability. I still remember the first time that I watched “the Freak” play on TV. It was Week 5 of the 1998 NFL season and my parents let me stay up for Monday Night Football to watch the Vikings, play against my favorite quarterback, Brett Favre, and the Green Bay Packers at Lambeau Field. I remember that first possession as Randall Cunningham took the snap and threw the ball deep down the field to Randy Moss and he almost effortlessly reeled it in and ran for a 75 yard touchdown. I had never seen anything quite like it. Cris Carter had always been my favorite player growing up, and still is, and while all Carter did, “was catch touchdowns”, I knew that he could not do what this kid Randy had just done. The 75 yard touchdown pass was called back due to an offensive holding call but it didn’t seem to hurt as Randy Moss would have 5 more receptions in the game for 190 yards and 2 touchdowns leading the Vikings to a perfect 5-0 record. While many knew that Moss was special at the time, they had no idea he had just changed the entire landscape of the NFL. Just to be perfectly clear, I am suggesting that, like many of his acrobatic catches, Randy Moss singlehandedly changed professional football. In the same way that Babe Ruth and Jackie Robinson changed baseball, Wayne Gretzky changed hockey, and Michael Jordan changed basketball – Randy Moss changed the NFL. First off, I really do believe that the 5th major turning point I mention (re-introduction of instant replay) was due in part to the fact that nobody could believe that a rookie wide receiver was able to leap above three defenders, catch the ball, come down with both feet inbounds, and shake off those same three defenders to run for a touchdown. I have seen the footage of Moss’s Monday Night Football game against the Packers and his Thanksgiving football game against the Cowboys dozens of times, and 13 years later – I am still amazed. His greater impact though is that he changed the way the game was played. Brian Billick and Dennis Green (Vikings Head Coach 1992 – 2001) were two of the best offensive minds in the NFL during the 1990’s and both have mentioned how when it came to Randy Moss they had to forget everything they thought they knew about offense because when it came to Randy Moss, the same rules of offense just did not apply. After his Week 5 coming out party on national television, teams everywhere were aware of what he could do and they still could not stop him. Traditional defensive schemes did not seem to work. Teams would put two, three, even four defenders at times on Moss and he would still find the endzone. If he had not been playing opposite field from one of the greatest possession receivers of all time, they might have defended the Freak even more. Following an impressive Week 5 against the Green Bay Packers, Moss would face the Packers again in Week 12 at the Metrodome. The Packers were able to slow Moss down some but not by much. The Vikings won 28 – 14 and Randy Moss had 8 receptions for 153 yards and a touchdown. His statistical line against Green Bay (who had appeared in the previous two Super Bowls) in 1998 was better than some wide receivers had for the entire season. 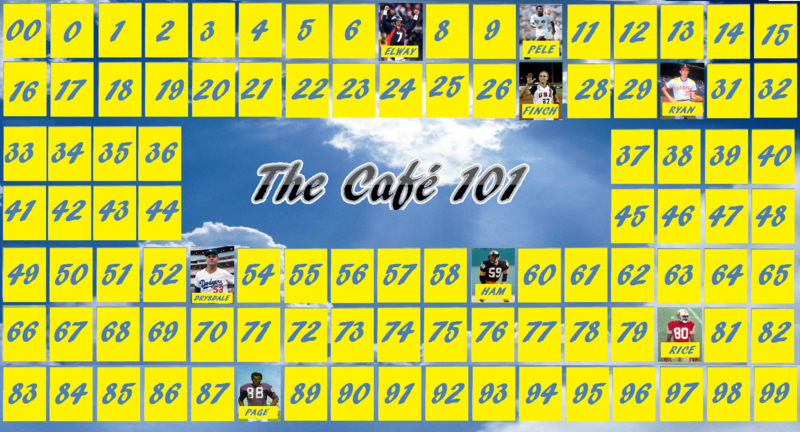 As a result the following season the Green Bay Packers used their first four draft picks on defensive players – a free safety, two cornerbacks, and a defensive tackle. The Tampa Bay Buccaneers, another divisional opponent, used the majority of their draft picks on the defensive players who would help lead them to a Super Bowl victory a few years later. Never before had one player so obviously affected the draft choices of another team. When I look at the NFL today, I see it being commonplace for safeties like Troy Polamalu and Ed Reed to play “over the top” to prevent the big play. I see the contracts that have been paid to “shut-down” cornerbacks like Nnamdi Asomugha and Darelle Revis. I assure you that when Asomugha receives the first check of his new contract, he had better send a thank you note to Randy Moss. Because like Lawrence Taylor made a strong left tackle a necessity, Randy Moss bolstered the importance of safeties and cornerbacks. The NFL that we watch today is very much a passing league with a lot more deep passing routes than previously seen. Much like Roger Bannister’s four-minute mile, it took Randy Moss showing the NFL that you could succeed with a pass heavy offense before it really became a trend in the NFL. Wide receivers like Braylon Edwards, Larry Fitzgerald, Andre Johnson, and Reggie Wayne have had success in offenses that were developed as a result of Randy Moss. If Randy Moss has indeed retired, he will surely have a press conference. Knowing him, he will even interview himself. And over the next few days phrases like “straight cash homey” and mentions of “squirting referees”, “bashing police cars”, “mooning fans”, and “screaming at caterers” are sure to be mentioned when talking about his legacy. These antics offended many fans and are sure to affect how Moss is remembered. We will be reminded of how he famously told us all that, “I play when I want to play.” And the fact of the matter is, right now, nobody’s offering him enough straight cash so he does not want to play. But when he did play, it was like nothing we have ever seen before. Offensive gurus had to create new playbooks, defenses had to create new schemes, and teams had to change their entire drafting strategy. And at the end of the day – that, more than anything, is the Freak’s legacy.